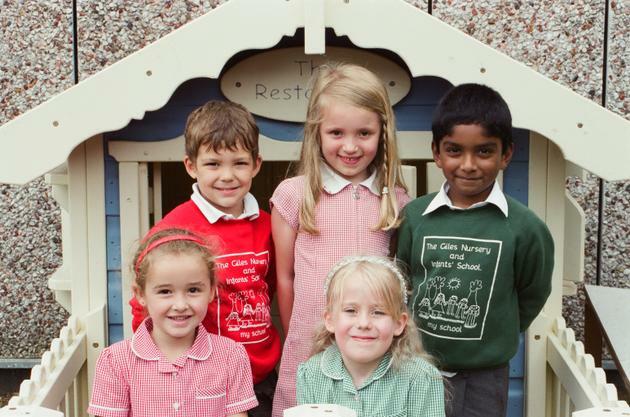 Our school uniform supplier is: Smarty Schoolwear Ltd. If you would like to order online, all you have to do is click on the link below. This will take you to The Giles Nursery and Infants’ School uniform page on Smarty Schoolwear's website. You may also order by calling their office on 01707 263909 Monday to Friday 9am to 5.30pm.You can also buy and/or collect your pre-ordered uniform from Smarty Schoolwear's shop: 66 Town Centre, Hatfield, AL10 0JJ. Free weekly delivery of orders will be made during term time on Tuesday afternoons to the school and will be given to your child to bring home. Alternatively, delivery can be made to your home (fee payable). We also have a limited stock of older style uniform for purchase from the main school office. Don’t forget that you can also buy much of our non-branded uniform from major supermarkets locally! Every child should have a pair of plimsolls in a names draw-string bag. These can be purchased from the school office. All children’s clothing should be labelled with their name. Children should always bring a warm outer garment such as a jacket or coat for outdoor play. For PE children wear PE shorts and a plain white T-shirt.